Milan (AFP) - Australian rider Michael Hepburn pulled on the Tirreno-Adriatico leader's blue jersey after his Mitchelton-Scott outfit won a crash-marred opening team time-trial stage at Lido di Camaiore in Tuscany on Wednesday. Hepburn's team narrowly avoided an accident one kilometre from the line when a woman walking her dog on a leash crossed in front of the riders. Earlier two riders from the German Bora-Hansgrohe team had collided at speed in wet conditions with a pedestrian who crossed the road. Italy's Oscar Gatto and Poland's Rafal Majka finished the race, but suffered bruising, with the team ending the day in 20th position. The pedestrian was taken to hospital but was reported not to be in a serious condition. "We got a fright when we saw the Bora guys," said Hepburn. "And then the dog... Luckily we saw it, it could have been more serious." The Mitchelton-Scott team clocked 22min 25sec to finish first with Slovenian Primoz Roglic's Jumbo-Visma team second at 7sec with Tom Dumoulin's Sunweb third at 22sec. "I didn't expect to be in this position when I woke up this morning," continued 27-year-old Hepburn. "We were quietly confident in our team, we have a lot of big boys, a lot of powerful time trialists and today was one of our chances to get some time and we did that. "We're not targeting just the stage but also supporting Adam Yates on (the) general classification." Yates, whose twin brother Simon won last year's Tour of Spain, is among the favourites for the race which ends on the Adriatic coast next Tuesday. "We've been trying to win a team time-trial for a long time, I think I've been here four or five years now and every time we try, every year we bring a super strong team and we’ve been close and now we’ve finally got it!" 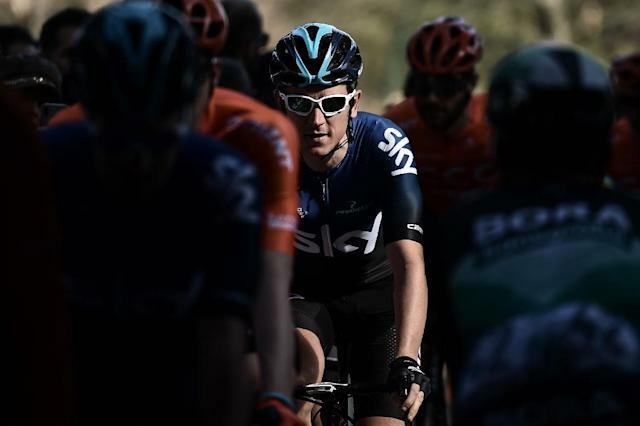 Tour de France champion Geraint Thomas's Team Sky were fifth at 47 seconds behind. Thursday's second stage is a 195km run between Camaiore and Pomarance, passing through Pisa and along flat roads before a 12km uphill finish, with the gradient topping out at 16 percent.